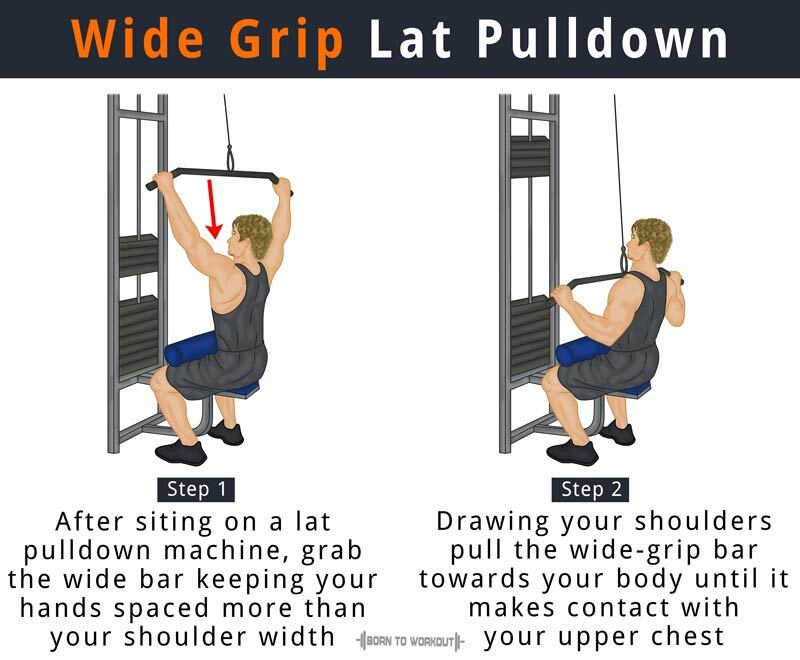 Assume a seated position on a lat pulldown machine that has a wide-grip bar attached to its top pulley. The knee pad should be properly adjusted so that it is suitable for your height. Grasp the wide bar using a pronated grip (palms facing forward), with your hands extended at a distance more than your shoulder width. Since both your arms are extended in front, you need to bring the torso back and create a curvature on the lower back so that you can stick your chest out. It is the initial position. Draw your shoulders and move your arms down and then back to pull the bar towards your body until it makes contact with your upper chest. Wait for a second or two at the point of full contraction. Squeeze the shoulder blades together, and when you fully extend your arms and stretch your lats, raise the bar to return to the initial position. Perform the desired number of reps by repeating this movement. On reaching the maximum contracted position focus on squeezing your back muscles. Use only your upper arms to bring down the wide handle while your upper torso remains stationary. Avoid doing the lat pulldown behind the neck variation because it can strain your rotator cuff muscles owing to the hyperextension produced by bringing the handle behind the neck.